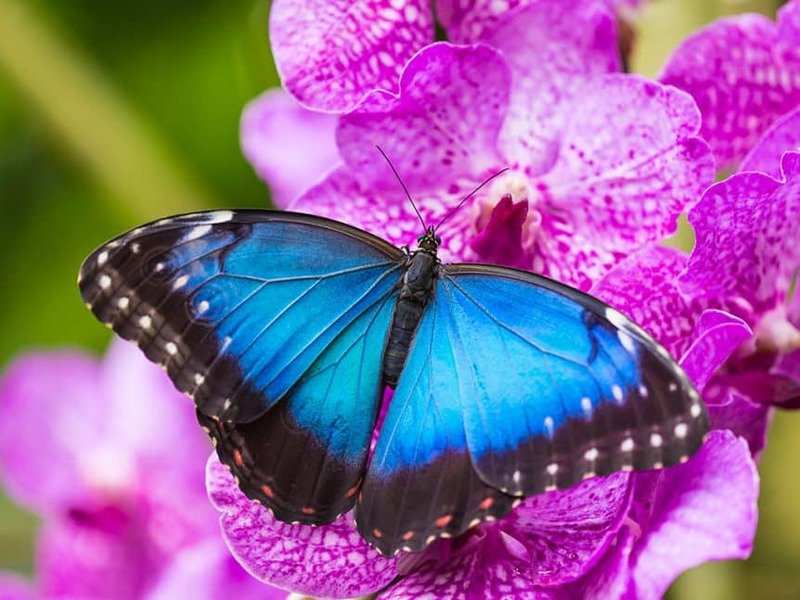 There’s nothing quite as mystical as strolling through a tropical garden and having an iridescent purple-blue butterfly gracefully sail past you. Blue Morpho butterflies have been fascinating to cultures for 100’s of years, and they continue to fascinate us today. Normally you’d have to travel to Central and South America to see this amazing group of butterflies. Morphos belong to the Nymphalidae butterfly family (the brush-foots), and then have their own subfamily, Morphinae. There are upwards of 30 species of Morphos, although scientists have also identified as many as 140 subspecies. Regardless of how they are named or categorized, they’re simply amazing! Morphos have a remarkably shiny iridescence that sets them apart from other butterflies. Their azure iridescence is as a result of specially structured scales on their wings. All butterflies and moths have scales covering their wings, head, and body – this is what gives them their colours & patterns. The scales on a Morpho butterfly wing are structured in such a way that they cause light to refract and scatter blues, purples and anything in between. Butterfly scales are very tiny and very numerous – there can be as many as 5,400 per square centimeter on the wing’s surface. 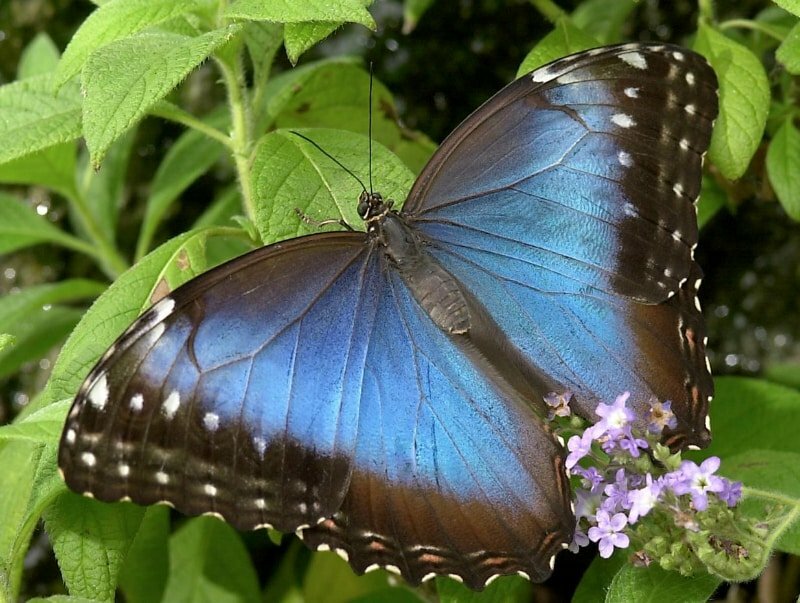 At Cambridge Butterfly Conservatory, we are pleased to host the Blue Morpho (Morpho peleides). They are raised as caterpillars on a sustainable, non-profit butterfly farm in Costa Rica and then shipped to us (along with hundreds of other Costa Rican butterflies) as pupae (chrysalides). At times we have up to 400 Morphos flying in our Conservatory, although it’s important to remember that they’re not always in flight. In fact, they’re pretty good at hiding. The bright blue which makes them so recognizable can instantly be hidden as soon as the butterfly folds up its wings. While the upper side of the wings displays a dazzling iridescence, the underside of the wings shows a variety of soft browns and blacks (with hints of pink & yellow) that enable it to camouflage quite effectively. The undersides of the wings also display multiple fake eye-spots to further break up the pattern. In this way, they can camouflage pretty well among the dark, deep foliage of a jungle setting. When at rest, they close their wings and effectively blend into the background. This can make it a little frustrating for photographers wishing to capture the blue iridescence! One tip for success is to watch for a Blue Morpho basking in a sunbeam and hope it opens its wings to bask in the sunshine. Males use their flashy colours to attract potential mates. However, attracting attention can also have a downside, if it attracts a predator instead of a mate. Their cryptic brown colors on the underside of the wings gives them a way to “turn off” their showy blue so that they can hide when threatened. On a sunny day at the Conservatory, they will be the most active, showing off their shiny blue upper wings. Otherwise, keep your eyes peeled for them resting among the leaves & branches. And don’t pass them by should their wings be folded up: the underside of their wings are just as beautiful as the upper blue surface. They, like many people, are beautiful inside & out.